View our Paleo Beetroot Burger featuring Living Goodness Sassy Sauerkraut. 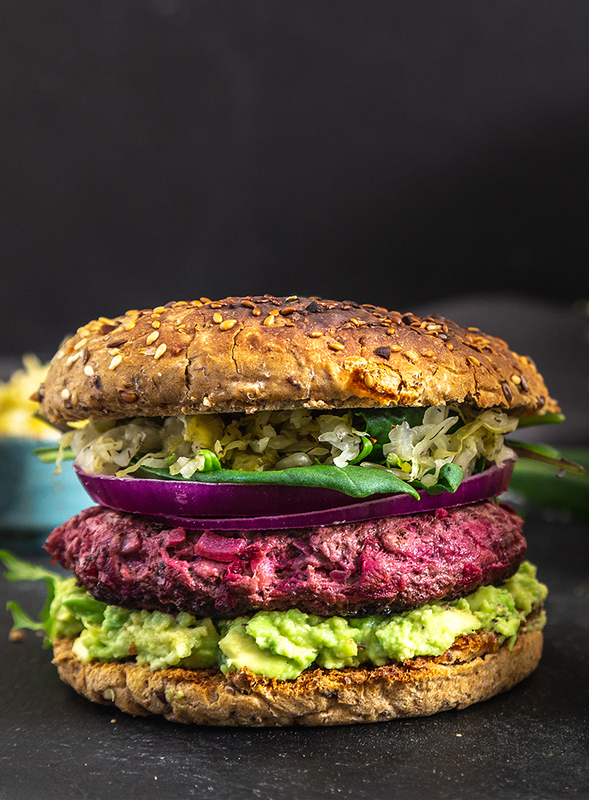 A tasty and healthy beetroot and beef burger great for made for a summer barbecue. • Heat oil in a pan and cook the onion and garlic over low heat until soft. Allow to cool. • Place onions and garlic in a large mixing bowl and add all other ingredients, season with salt and pepper. • Mix the ingredients together until well combined. Make sure not to over mix the mince. • Using about 1/3 cup of mixture for each patty, roll into balls and press into burger patties. • Refrigerate for about 30 minutes. • Heat some more oil in a pan or on a BBQ and cook the patties over medium heat for approx 4-5 minutes each side until cooked. • Serve in toasted paleo buns with the following fillings; smashed avocado, red onion, greens, pesto and a hefty dollop of Sassy Sauerkraut.